I've been hearing some complaints, and had some myself of the City Panel. I generally thought the lack of information on the panel itself was it's greatest downfall, and wanted to correct this. 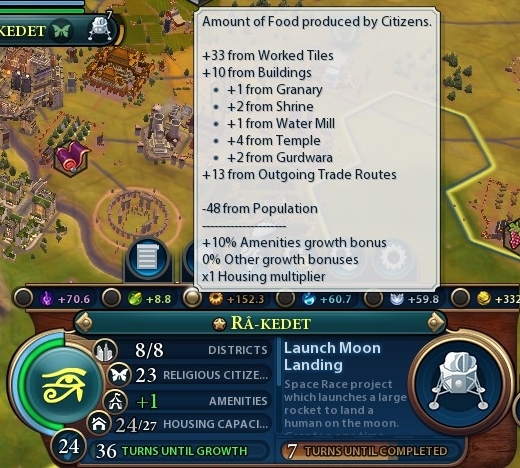 Mostly what I've done is added a ton of the information that can be found in additional information tab onto the panel itself as tool tips, switching the food yield to show growth yield instead of total, and also replacing the "Number of Buildings" bar for a "Number of Districts out of Total Possible" bar. Now if you hover over the new "Districts" bar it'll show the built districts in the city, and the buildings in each district. As well as telling you when a building or district is pillaged. 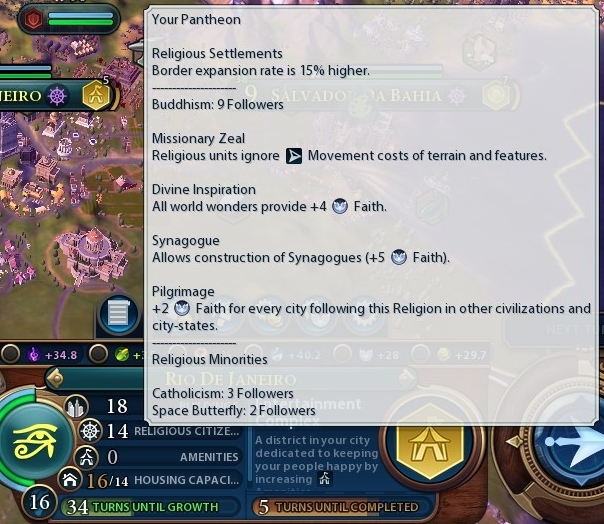 The tool tip for the religions bar shows how many citizens follow each religion, your pantheon belief, and benefits of the dominant religion in the city. The tool tip for the Amenities bar shows the current mood of the city the benefit/hindrance of that mood, and the breakdown of what's causing the lost/gains of Amenities. Hovering over Housing will give the current food modifier from housing. Added food lost from population, and modifiers to the food tool tip. The production bar on the city panel has been changed to show total production on the right side of the bar. Whenever the production panel is open the city-panel now moves the the left as to not be covered up by the production panel. The Growth bar has been shortened to make room. Expansion Bar that show total Food and Culture. Added tooltips to the Growth Bar. You can now turn off the mod from the main menu. It'll still enable from the start. Added info to current production in the form of a tooltip in the same way a tooltip would be displayed in the production panel. 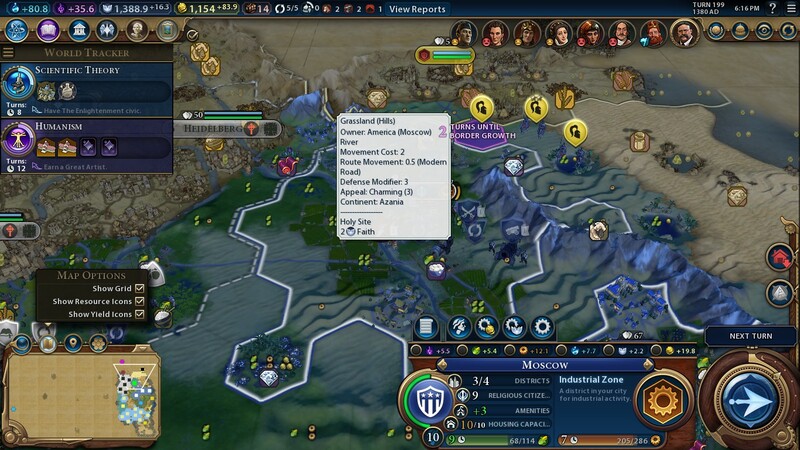 Right clicking the current production icon will links to the civilopedia of what ever's being produced. 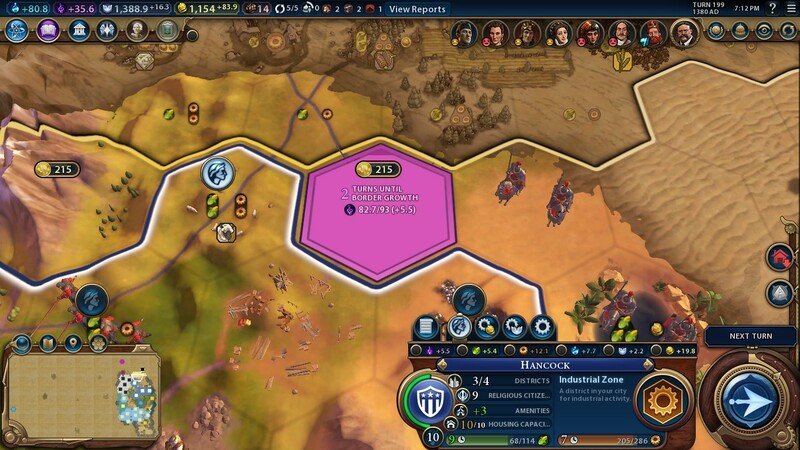 Next growth tile will display when a city is selected. Additional information is displayed when the city manager is open. Citizen Growth bar changed back to normal size, and now resembles the production bar. 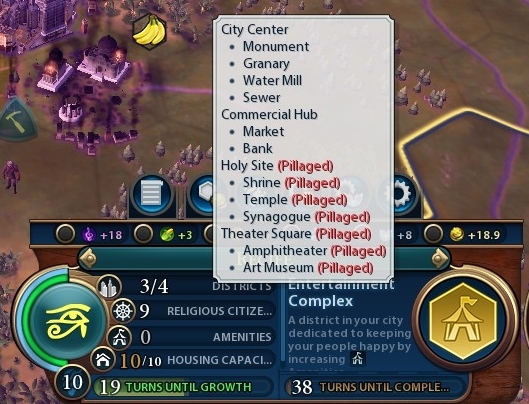 Merged the Manage Citizens, and Purchase Tile tabs. This can be reverted back by setting uo_CityManagementMerge at the top of the CityPanel.lua file from true to false. You can also Merge the Production Panel tabs, but this is not on by default. To merge the Production Panel tabs set uo_CityProductionMerge at the top of CityPanel.lua file from false to true. (technical) Tabs on top of the panel are now connected to a lua event that can be fired by external mods to add new tabs. Drop the contents into the DLC folder. Nishdog, Kabba QuzAi and Ace Cooper like this. 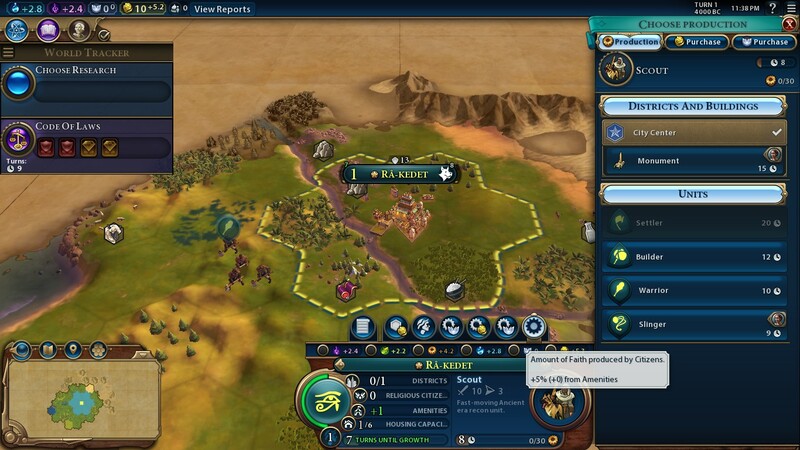 This is probably the most needed change in Civ VI. GREAT JOB! I have one issue, seems like every time I place a district down it then locks the "Manage Citizens" to "Change Production" buttons. The only way to get them back to function is to load the game back up. There are a lots of good information in the new UI yuri has created ! I love it ! Thank you so much, and keep on enhancing! Best mod I've seen so far. Thank you, Yuri!